In August of 2007 I was on Safari in Northern Namibia, Africa. I was hunting just South of Etosha with my PH, Barry. It had been a very successful hunt so far. I had used my .300 Win Mag with 180 gr Cor Lokt bullets to put eleven animals 'into the salt'. The terrain was Mopane woodlands interspersed with savannah areas and heavy bush consisting of Acacia growth such as Camel Thorn and Black Hook Thorn. It was perfect country for Giraffe. Barry and I had seen a lot of Angolan or Smoky Giraffe on Safari so far. These animals occur in Angola, Zambia, and Namibia. I wanted to hunt a Giraffe. I had a new .375 Ruger in my African battery. It had not been used yet. The heavy rifle was made for dangerous and large game such as Eland and Giraffe. Barry and I thought the gun would do quite nicely when hunting a Giraffe. Barry and I discussed the Giraffe hunt. He drew a picture of a Giraffe in the sand and pointed out to me where to shoot the animal. A frontal shot between the two shoulders could be effective but required true marksmanship and a bit of luck. A neck shot could be attempted but this also required a high degree of marksmanship and luck. A broadside heart shot required the bullet to pierce one inch of tough skin and a foot of meat before a vital organ could be reached. Barry said the Giraffe is a very tough animal to bring down cleanly. Making an animal suffer is a horror story to me and I would never want to cause that. Barry was satisfied with my marksmanship and he assured me that the Hornady 270 gr SP bullets fired from my Ruger African .375 Ruger would do quite nicely on a Giraffe. The morning of the hunt I got up early and sat before the Mopane wood fire and drank coffee. The Giraffe hunt was a big event in camp. Giraffes are expensive to hunt and not too many hunters can explain the cost to their wives. A Giraffe hunt does not happen every day. We would hunt on Janni's farm. Janni had about 50 Giraffe on his farm and they had been lightly hunted. We stopped at the homestead to talk to Janni and his wife. They were very courteous and friendly. We told the skinners that we would bring back a Giraffe soon. The skinners smiled and said,"Much Biltong!!" We drove out into the bush and started to look for Giraffes. The trackers were perched high up in the back of the truck to ensure a wide field of vision. After a while one of the trackers got excited and pointed to his right. Far off in the distance, rising above the scrub brush like the Brontosauruses in the movie Jurassic Park, were four bull Giraffes. We approached to within 150 yards of the Giraffes. They were in a small savannah. There was a lot of prickly and thorny herbage between us and the Giraffes. We spent about 10 minutes glassing the bulls. bush. The thorn entrapped my ear. I was paralyzed. Yassir, the tracker, carefully worked my ear loose from the vicious thorn. Only a little blood was lost. We came to a small clearing. There was a large Mopane tree at the edge of the clearing. We glassed the Giraffes from about 120 yards. I picked a nice bull with large horns, a beautiful creamy colored coat, and a reddish mane. When I had made my selection, Barry said to hit the Giraffe on the shoulder. I placed the .375 Ruger against the Mopane tree, carefully placed the Leupold scope's crosshairs on the Giraffe's shoulder, released the safety, and slowly squeezed the trigger. At the report of the heavy rifle, the Giraffe moved slowly to it's right. I had made a direct shoulder hit but the Giraffe did not appear to notice. Barry said to put another bullet into the Giraffe. I worked the bolt, chambered another round, and shot again. The Giraffe was still on it's feet. The Giraffe's herd mates had moved off. The Giraffe was alone on the savannah. Barry said to shoot again. I made my last shot good, the Giraffe staggered and fell to the earth. Barry said, "Well done Captain!! Good shooting!!" I reloaded my rifle and we walked through the thorns to the fallen Giraffe. It was still kicking. I had heard that Giraffes can kill a Lion with a well placed kick. I put another bullet into the Giraffe. The Giraffe lay still. I could not believe it. My Namibian shooting Safari was over. I had been wildly successful. We took many photos. The trackers cut a road through the bush to get the truck next to the Giraffe. I told Barry that I wanted the head and one third of the neck mounted. I wanted the skin as a tablecloth or a rug. Barry said he would give me the shin bones to use as towel racks. We found that my first bullet had gone through one inch of tough skin and a foot of meat before piercing the Giraffe's watermelon sized heart. The animal had stood for awhile after the shot but was essentially dead on his feet. The skinners used a winch and much manpower to hoist the Giraffe carcass into the back of the truck. We cut a large loin steak out of the Giraffe. The meat was so fresh it was still quivering and contracting. We grilled the Giraffe steak over a Black Hook Thorn fire. I have eaten a variety of wild game in North America and Africa. I can honestly say that this Giraffe steak was the best meat that I have ever eaten. It was flavorful and as tender as butter. Barry had bread and a tin of South African jam. To top off our meal we toasted jam sandwiches for dessert. I drank Grape Fanta to quench my thirst. Barry presented me with a fine Cuban cigar to celebrate our successful hunt in Namibia. What a way to end my shooting Safari!! I had harvested every animal on my wish list and more. I already had it in my mind to return to Namibia with my .375 Ruger and shoot a Majestic Eland. Hunters always say that one Safari to Africa is not enough. Many of them return. I certainly would like to return to Namibia!! Your article provides a lot of justification for Giraffe farming. For poor economies like ours in Uganda Girraffe meat would earn this country much better returns than cattle meat. All African countries should swiftly conduct reaserach into this delicacy. If we targeted to export this staff to the US and later China, Poverty would be a thing of the past. Of course we as Citizens farmers would be treated to the first bite. Thanks a lot, Please come to Uganda and when you do I would love more of those mouth watering details. Your giraffe is awsome and thank you very much for all that information coz i needed it for an assignment. 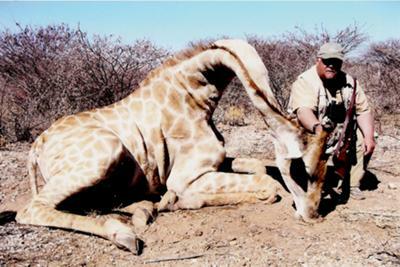 I have hunted in three African countries and have seen many Giraffe and two shot. I did not think they were hard to hunt at all as you can get up close and personal without any problem. The two I saw shot were both shot with 30.06 - one with one shot the other 3 shots. Good hunt and usual successful end. Congratulations on the giraffe. A wonderful detailed description of a hunt for a strong and beautiful Beast. I have to get me a .375 Ruger! The article was very well written with all the description, you can actually picture in your mind what the author is experiencing. I would like to be in that situation; up close to a Giraffe. Unbelieveable!! The story and picture of the giraffe is just amazing and makes me want to go and see the animals that are in Africa. I have never eaten giraffe meat and would like to try it. I'm glad the author mentioned they are trying to preserve this animal. Interesting notes on the toughness of a giraffe. The Giraffe is not all that rare in Namibia. The Namibian Constitution mandates Conservation areas in each locality. There are more game animals in Namibia now than in 1960. Hunting ensures healthy and genetically balanced herds. There are more Giraffes in Namibia than ever before. Namibia is a hunters and wildlife lovers Paradise. Good story of a very rare and pretty animal.